Sanctuary Ranch is part dude ranch, part therapy-dog training center, and part refuge for those, regardless of age, who need a second chance at life. Haylee Hansen, who trains the therapy dogs, was her aunt’s first rescue. After losing everything that mattered to her, she almost self-destructed, but her aunt’s love for her never wavered. She has created a useful, satisfying life for herself and found family in her aunt and the regulars at Sanctuary Ranch, but the wounds from her past have never fully healed. She has no idea a part of that past is about to become part of Sanctuary Ranch. For thirteen years, Aiden McCall ran a Level 1 emergency room at a large hospital, but he has been forced to take a leave of absence. After the death of his young son in a horrific automobile accident and a shattered marriage, Aiden experiences severe PTSD with tormenting nightmares and panic attacks that render him dysfunctional at work. Serving as the ER physician in small-town Sunset Bay, Oregon, offers lower stress and an opportunity to deal with his problem. Haylee’s dog Jewel introduces Haylee and Aiden, and his decision, on doctor’s advice, to try a therapy dog to help with his PTSD extends their connection. Aiden is reluctant to answer the questions Haylee poses as a preliminary in agreeing to his having one of her therapy dogs, but she is as protective of her secrets as Aiden is of his. The emotional link between these damaged people is strong, but finding a future together will require them to confront the demons they have been unable to escape. 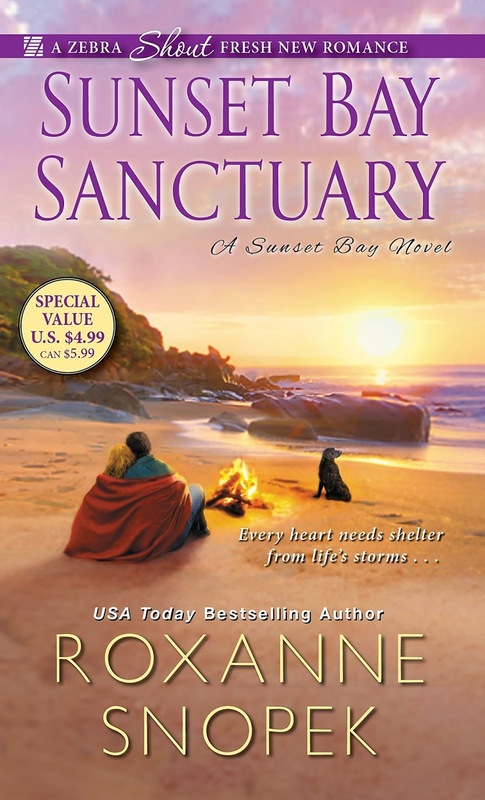 This novel introduces the Sunset Bay series with a powerful, emotional tale. The romance will touch the reader’s heart and activate her tear ducts, but the book is larger than the romance. Haylee and Aiden individually have compelling stories, and the supporting characters are interesting, dimensional people as well. This was my first book by Snopek, but it will not be my last. I have added Driftwood Creek (June 26, 2018), the second Sunset Bay book to my book calendar, and I will be checking out her backlist too. I have just added this to my wish list. This sounds like an amazing book. I hope you enjoy it, Pamela. I'm hooked on the series after just one book. Nice review. 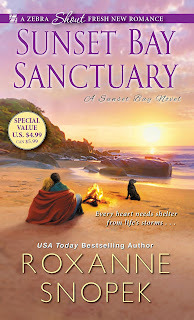 I loved this story and am looking forward to others by Roxanne. Thank you for introducing me to this series. I love an emotional read. Oh, this story sounds so appealing on so many levels. Will have to search it out.